The Thompson Research Center Field Day will be held on Tuesday September 15, 2015 at the research center in Spickard. 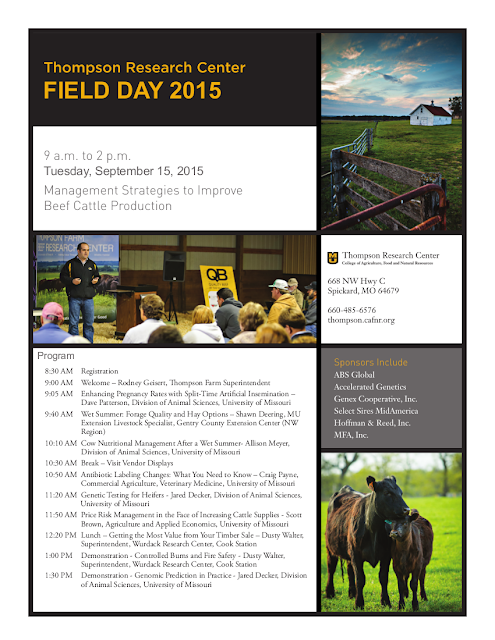 I will be discussing the use of genomics predictions in registered and commercial heifers. In addition to my talk and demonstration, there will be information on reproduction, nutrition and forages, antibiotic labeling, economics, and timber sales. In the survey below, let me know what topics or questions you would like addressed in my presentation. For those of you in Northwest Missouri, I would love to see you there.